The World Health Organization’s Europe Health Evidence Network (HEN) just released a review of measurement strategies for community resilience, and featured ISC’s report Building Community Resilience in Maricopa County as a case study of a successful inter-sectoral approach. 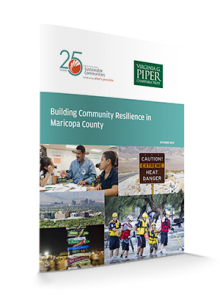 The 2016 report was the foundational document that prompted the creation of the Advancing Community Resilience Partnership, which aims to inspire, align and accelerate a shared vision for the people of Maricopa County to further build a strong community shaped and shared by all. You can read the HEN’s case study about the report excerpted below. Building Community Resilience in Maricopa County (Arizona, United States) (57) was an intersectoral assessment of community resilience across a large region with around four million residents. In taking a whole-system approach, sectors included environment, economic development, education, arts, family services, public health and private and non-profit-making sectors. Regional challenges included rapid population and economic growth, an intense desert climate and perceptions of a limited role for the public sector in society. The Institute for Sustainable Communities, with support from a charitable trust, set out to assess community resilience in Maricopa County for the purpose of planning actions and investment. Resilience was defined as “the ability of people, communities and systems to manage shocks and stressors and build stronger, more prosperous communities”. asset of significant institutional expertise in water supply management. The report concluded that the community resilience framework “has the ability to knit together disparate efforts to build economic, social and climatic resilience by spotlighting the connections and the critical interdependencies between them”. This case study illustrates that extensive data collection across multiple sectors can provide a high-level summary of regional vulnerabilities and assets as a “strategic lens” to inform intersectoral action on community resilience.